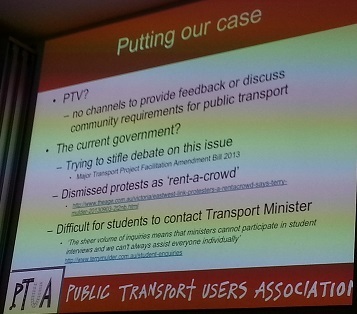 Yvonne Kirk from Public Transport Users Association. Students Linking Melbourne Sustainably (SLiMS) support sustainable transport and oppose the proposed East West Link road. This is a recording of SLiMS free public forum on the topic of “Sustainable Transport Alternatives to the East West Link”., held on Thursday 19 September at Middle Theatrette, Babel building, The University of Melbourne. This event was supported by the University of Melbourne Student Union Environmental Committee.